I was on my way to the laundry room with our long-overdue-for-a-wash shower curtain liner and thought “hold the phone”. Sam could totally paint on this before I wash it. I laid it out on our floor and added some globs of “Crayola Finger Paint Bath Soap” that I got from the dollar section at Target. I probably could have done any paint but this seemed like fun for this activity. 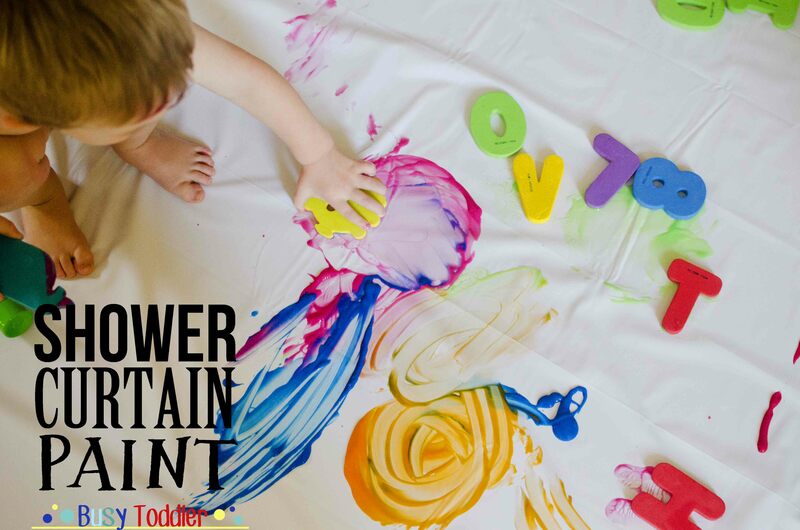 Fair warning, those paints are not tear free so just know your toddler audience before you use it. 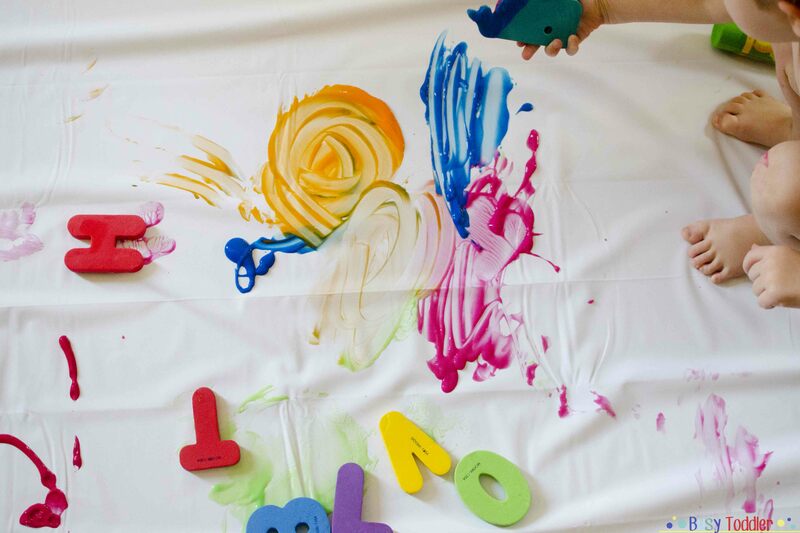 I also added our Munchkin Bath Letters and Numbers as a fun “tool” to paint with in addition to just using our fingers. Anti-art Sam actually played with this for a whole 5 minutes. I know, just five minutes for all that work, but in the Sam world of art, that was a long time. This kid just isn’t into painting BUT I know this is a good activity and an art interested toddler would love this. Sam really did love it for his 5 minutes of fun, but he’s just not going to sit and paint for 20 minutes like some lovely toddlers I know. Still, I keep introducing him to art because some.day. Someday he will like it. At least I keep hoping. The texture of the paint on the liner was perfect and made for slippery fun. My “exit strategy” for this project was having a wet towel ready for an initial wipe down of Sam – just enough to carry him to the bath tub for a fun afternoon popsicle bath post-painting. The letters went into the bath with him for a rinse off and the liner went right into the washing machine. In under three minutes, everything was back to clean or in the process of getting clean. I loved using the shower curtain liner so much for this project that I actually bought a second one (for a whole $5) and have it now as a make-shift toddler tarp for future messy projects. It’s already come in handy and more than paid for itself. and prepared to assist with any of your web hosting requirements. 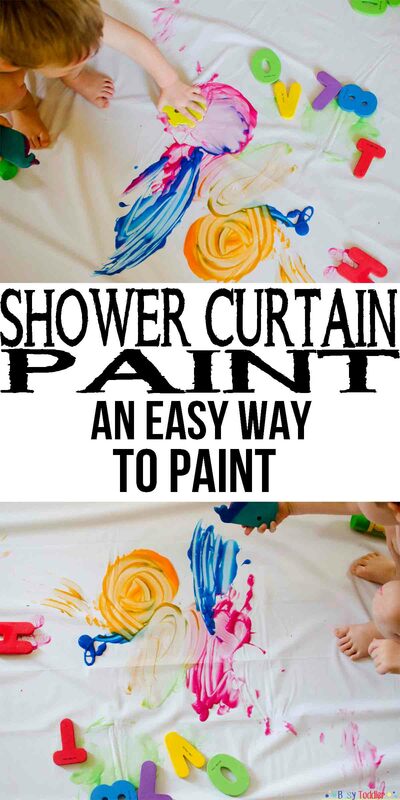 I LOVE this idea particularly because of how large a shower curtain is! Logistically, how and where do your rinse the paint off without making an enormous mess? Thanks! I just bought a vinyl shower curtain liner at Dollar Tree yesterday, specifically for messy projects. Great minds think alike! Got the jumbo plastic tweezers there too although they are a bit too difficult for my little guy’s hands at this point. Love this idea!